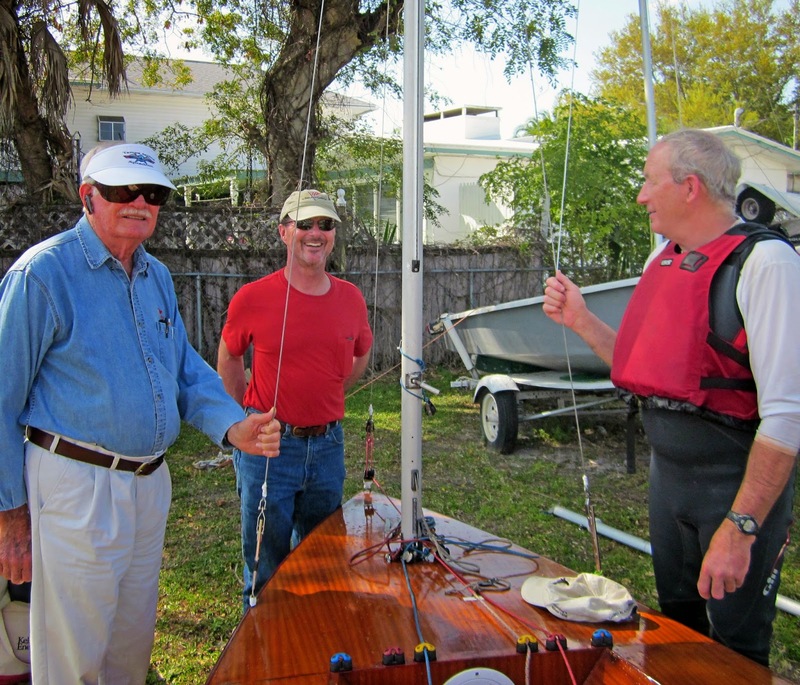 The previous header photo was of the 2011 Classic Moth Midwinters, held at Gulfport Y.C Florida, the last one I attended. 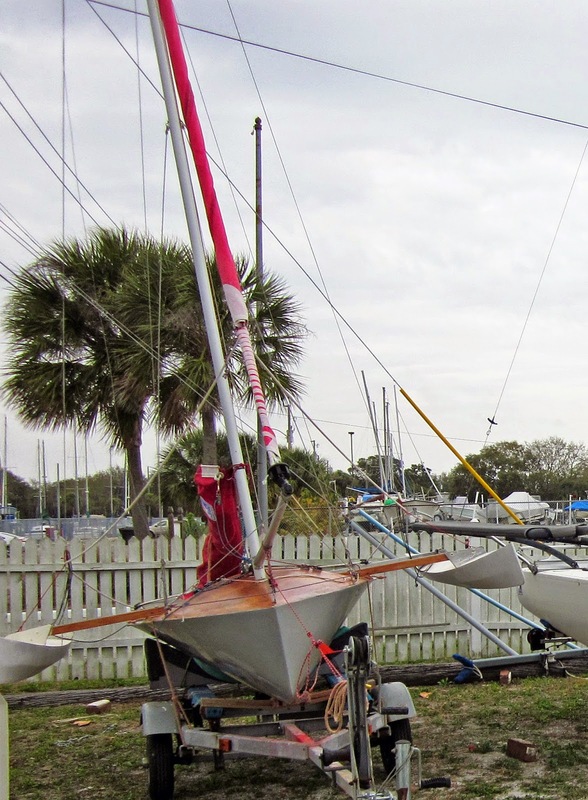 The 2015 Midwinters were held again at Gulfport Y.C, over the crossover February/March weekend. Ten Classic's attended but unfortunately, this year, no-one from the Florida fleet raced. 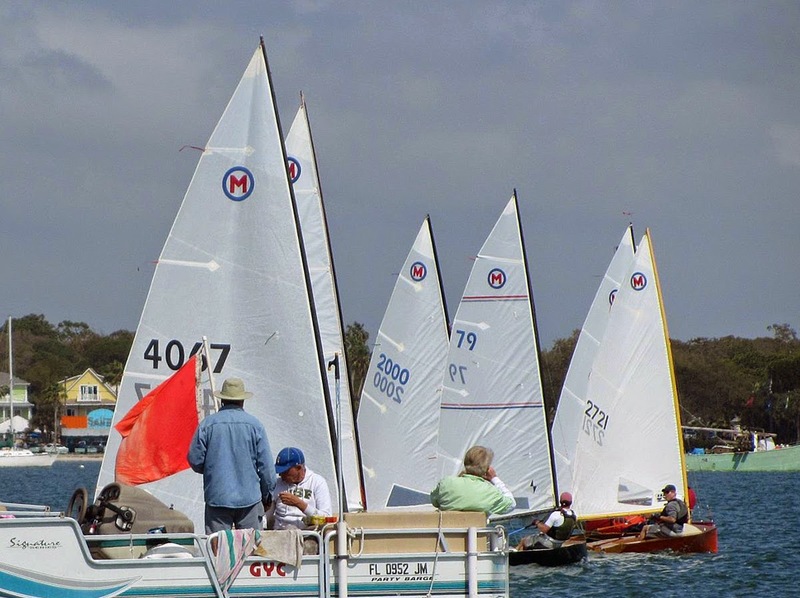 Saturday's racing was called off with the threat of thunderstorms but Sunday offered up warm temperatures and a pleasant racing breeze. Mark Saunders arrived with a makeover on his venerable Mistral; he added a "Linton rocking" rig and a new North sail to secure victory in Gen II class. The three Mistal's finished at the top of the heap in Gen II with a Skol, a Duflos, and a modified, Lane Reeves Mistral following. 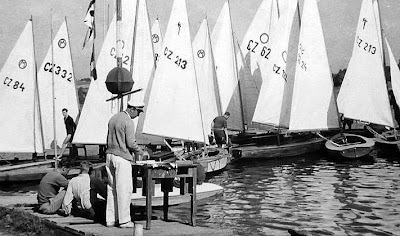 In the Gen I class, long time class stalwart, George Albaugh in his Olympic Europe, finished comfortably ahead of three other Olympic Europe dinghies. Much thanks to Amy Linton, who bore the brunt of the organizing this excellent regatta. A mix of photos from Amy Linton and John Zseleczky. One of the starts. #79 is Mike Parsons in his Mistral. 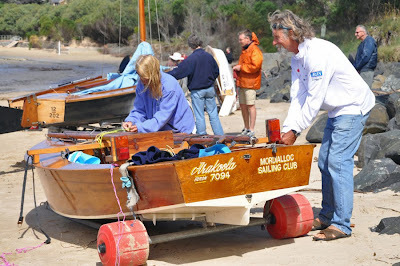 #2721 is Frickie Martschink in his Skol, and #4067 is Lewis Hayes, hugging the RC boat. 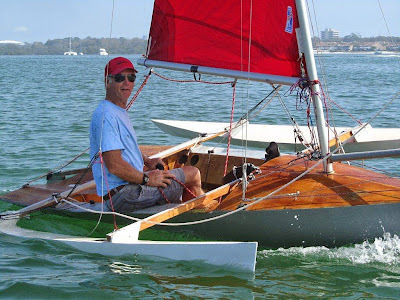 Erik Albaugh in his Lane Reeves, mod-Mistral. 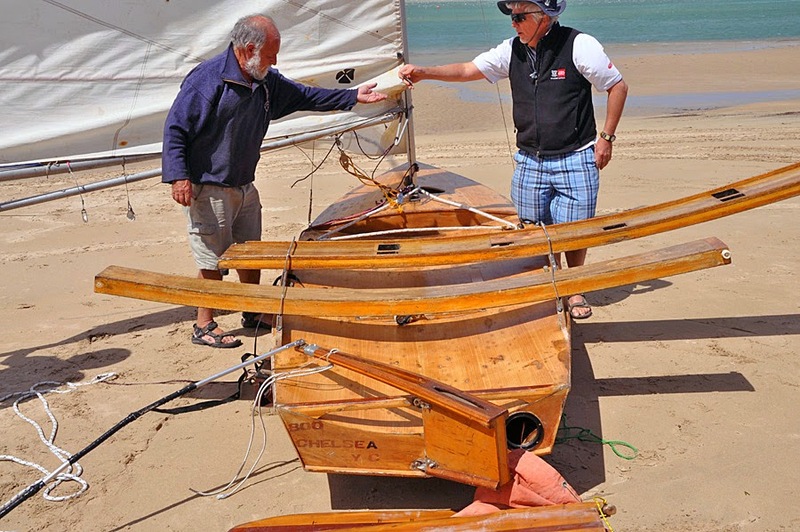 Lane Reeves, when he bent up this Mistral, ended up with a finer bow and a flat transom. Frickie Martschink - he of the post Lunch of Champions - had good speed in his Skol. Winner of the Gen II class, Mark Saunders in his Mistral. Famous designer, Charlie Morgan showed up to look at the fleet. It appears he cut his teeth on the Moth when he was a "youngin". Here is talking to Tom Price of the Chesapeake fleet. Charlie's son is standing next to Charlie. Two of the four Classic Moths from the Chesapeake fleet who attended. On the left is John Z's Mistral (he finished 2nd in Gen II) and on the right is Tom Price's Duflos. Rod Koch, George Albaugh and Erik Albaugh debate one of the finer design points of the Lane Reeves mod-Mistral. George and Erik made up the other portion of the Chesapeake contingent. Click here for other posts on the Classic Moth Midwinters. 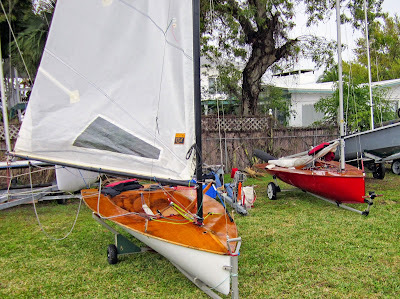 In response to my post about the aluminum Gouget Moth, several readers sent in some aluminum sailing dinghies they have come across. Australian "R.L". sent two photos of a welded aluminum version of the Australian 11' Aquanaut Dinghy, masterfully crafted. "I'm not sure who designed that alum dinghy I had, could well have been built as a prototype for the Vagabond, and therefore designed by Alan Payne. They maybe figured that alum was not the best way to go and so built the 3 class boats in glass. The 16ft Corsair is still going strong all over Oz, but the 12ft Vagabond and 10ft Gipsy seem to have faded. When I worked at Miller and Whitworth (Bob Miller and Craig Whitworth, sailmakers, Flying Dutchmen champs, and of course the legendary Bob Miller (aka Ben Lexcen). They became the agents for the 3 classes, and we would place an advertisement in the local paper for 'Free Sailboat rides', and we would take out prospective customers and then try to sell them a boat....was a fun job, but didn't get to see my kids much....that was 1966. Check out De Havilland Marine. I also worked there - that was where this boat came from. I bought it for 'scrap value', one of the perks of the job, I guess. In those days I was an accountant - ha...! In the U.S, Grumman remains the most famous firm for their line of aluminum small boats and canoes but their most enduring aluminum sailboat is their dink, much sought after by the cruising crowd. 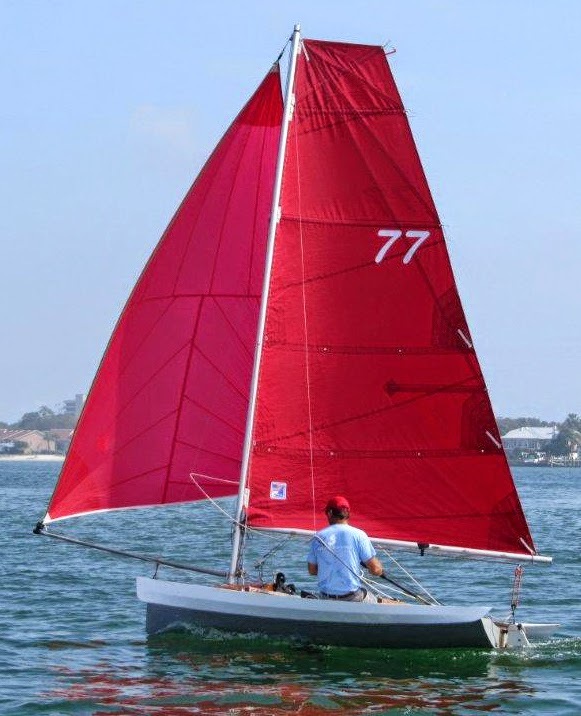 Tom Price pointed out that Grumman, in the late 1960's, built a 15' racing dinghy, called the "Flyer." Tom came across it at a Baltimore Boat Show. It doesn't appear many were made as this is the only image I could dig up about this dinghy on the InterWebs. And finally, the aluminum sailboat I came across at Bobby Muller's yard? After digging around it appears it was the Pelican class, a 12 footer design by Philip Rhodes, of which over a thousand were built by the Aluminum Company of Canada - Alcan. More info about the Pelican can be found at this blog post here. A nice roomy 12 footer. A video walk-around of a Pelican. For that very small, loose-knit group of Earwigoagin readers who are interested in my occasional music selections; an Americana folk foursome. First up, as pointed out to me by my good friend Ed Salva, a blues tune set to the beat of an ancient steam engine. My favorite bluegrass duo, Mandolin Orange, with a Bob Dylan cover, Boots of Spanish Leather. A folk tune I never tire of, The Stable Song by Gregory Alan Isakov. Finally, Love Ain't Enough by the Barr Brothers. 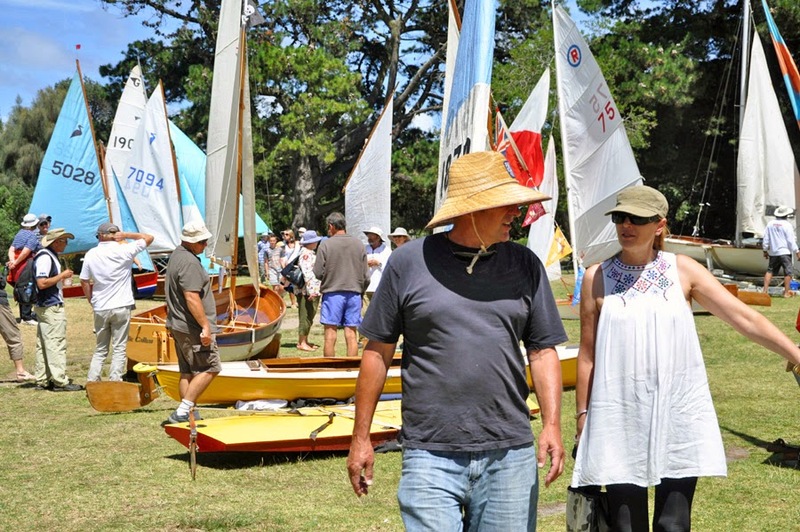 Andrew Chapman sends along some photos of the 2015 Australian Classic Wooden Dinghy Regatta, hosted by South Gippsland Y.C, out of Inverloch, Victoria, birthplace of the Australian scow Moth. Regatta was in late January. One of the starts. Left to right is the pram-bowed Mirror, Heron, two Sabre's, an Oughtred Classic Shearwater dinghy, and a scow Moth. A varnished Heron being rigged on the beach. 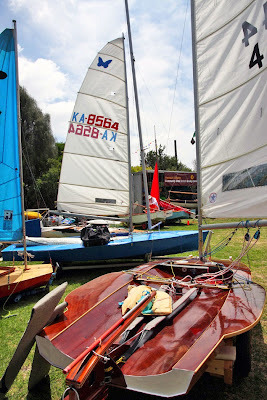 The Uffa Fox Jollyboat has a small fleet in Melbourne Australia. Popular in the 1960's, the 19 foot Jollyboat was eclipsed by the similar sized Flying Dutchman, with it's Olympic Status. 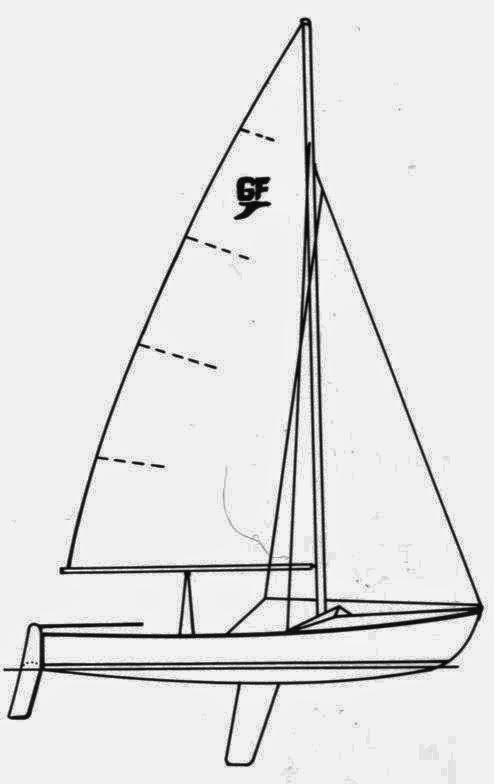 The two Jack Holt small doublehander designs; the Mirror Dinghy, at 10' 10" was the first stitch and glue kit dinghy and the earlier design, the 11' 3" Heron, was also designed for home boatbuilding in plywood. Both originally had gunter rigs as seen here. 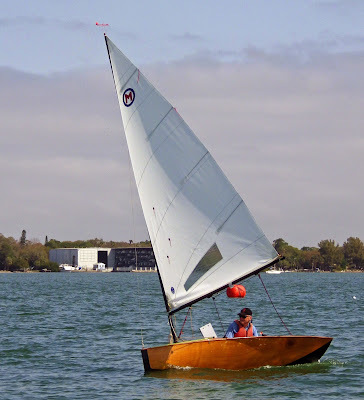 This scow Moth Maggie was just recently built by Ray Eades over two weeks and is a modified Imperium design. Mark Rimington is the owner and skipper. 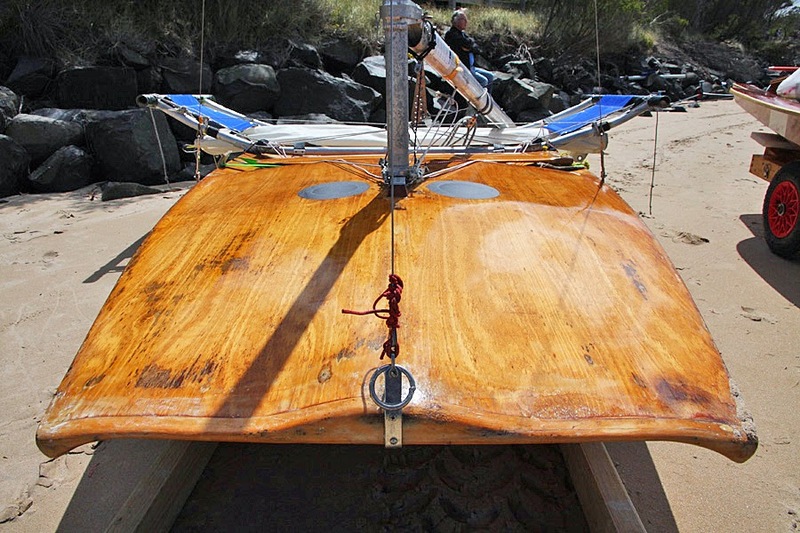 Beautiful decks on this new scow. 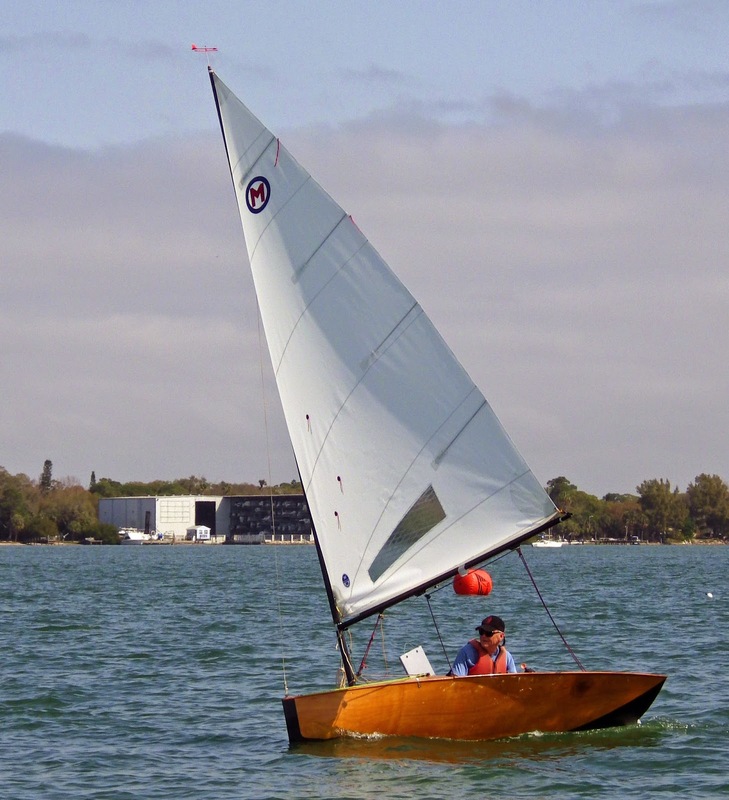 Rather than aluminum wings this scow was built with shorter wooden winglets. South Gippsland Y.C. is on Anderson Inlet, where a small protected bay meets the Bass Strait. 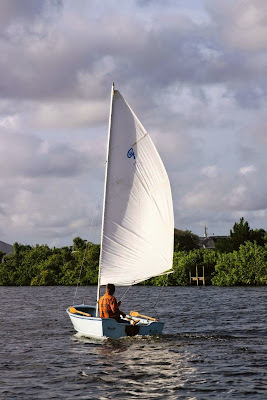 As Maggie sails toward the sandbar break, one can see the nastiness at the entrance to the Inlet when the breeze is on. 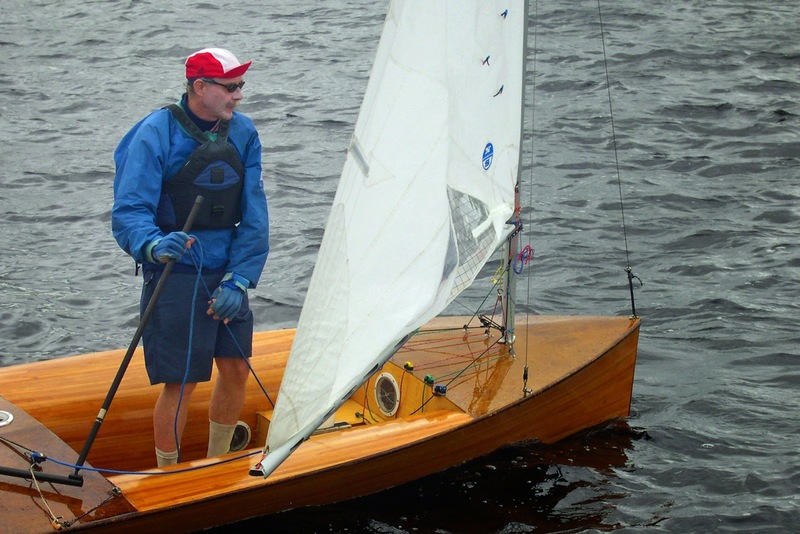 The Ian Oughtred Shearwater Classic Dinghy. 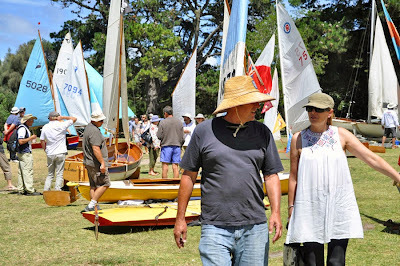 Fitted around the on-the-water racing shedule, the dinghies are exhibited at a seaside park for the locals to come and peruse (and vote on their favorite). 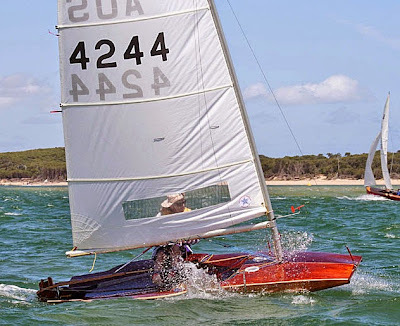 On the left is the Rainbow Scow, a popular class in southern Australia up to about 1970. This scow Moth is of the 1970's 1980's vintage, with aluminum wings. The VeeJay has a bigger brother, the double plank 14' Skate dinghy. This one looks as if it is being pieced together on the beach, after a long layoff. In the course of a discussion of sails among the local Classic Moth fleet, I went back and pulled out a photo of the blogmeister just chillin' before a start at the 2006 E-City Nationals. 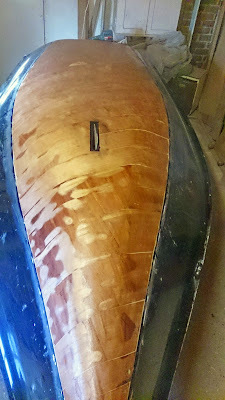 This is my all varnished Tweezer D design. My outfit here is kinda conservative. As some readers may remember, I have always had an affinity for natty looking sailing gear. I can't remember who took the photo. This may be one of Elisabeth or Ingrid Albaugh's photos. Dinghy Cruising Around the "Eye of Quebec"
This is a good video if you can block out the time - 40 minutes. A duo spend two weeks going around a natural circular body of water in central Quebec, formed by the impact of an asteroid. Three years ago, when John and I drove the Trans-Labrador highway, we camped one night on the shores of the great Manicouaga and it captured our imaginations. Finally, this year, aboard the expedition re-fitted Wayfarer 4610, we made the voyage. We were on the water for about twelve days after a two day drive north. It is an astronomically great lake. We camped ashore every night, and packed nearly 100 Ibs of dried food for the journey. We wore drysuits most of the time, cause the weather was typically cold and wet! Circumanic Higher Res from Scott McDougall on Vimeo. More information on the "Eye of Quebec" from Wikipedia. 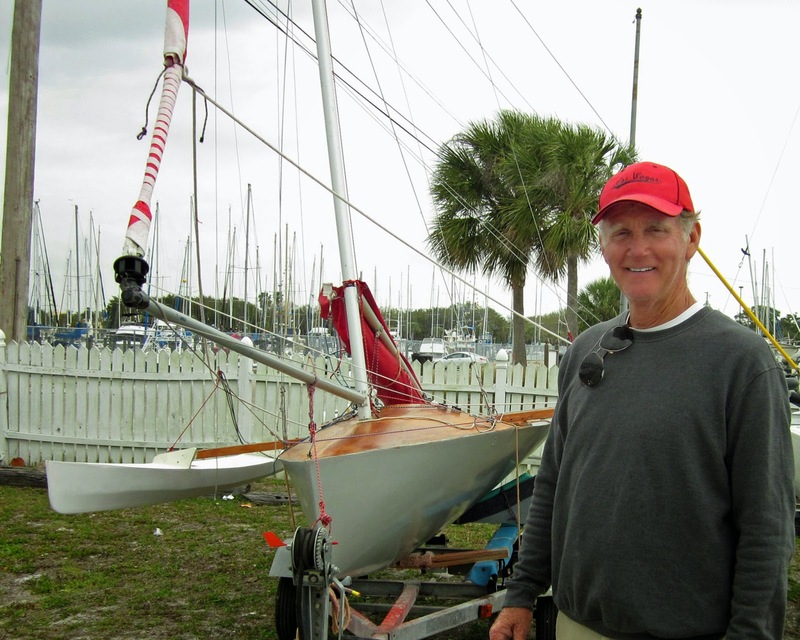 The 2015 Everglades Challenge starts tomorrow, a 300 mile sprint down the West coast of Florida in all manner of small craft. 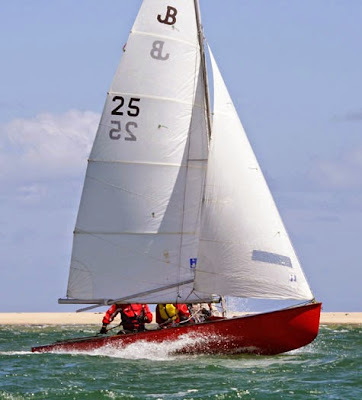 Last year, Classic Moth champion Jeff Linton won the monohull division in his extensively modified Flying Scot. This year we have a Classic Moth entered - well sort of. Joe Frohock picked up a Mistral Classic Moth that was languishing at the Gulfport Y.C. and made this tippy Moth into a trimaran - a Mothmaran. He unveiled the new Holland Tunnel over a year ago and in the interim he has already done a 100 miles jaunt in the contraption. Tomorrow will be the real deal. Len Parker can't believe his eyes. The Mothmaran uses stock kit Chesapeake Light Craft amas. The fixed prodder flys a gennaker on a roller furler. 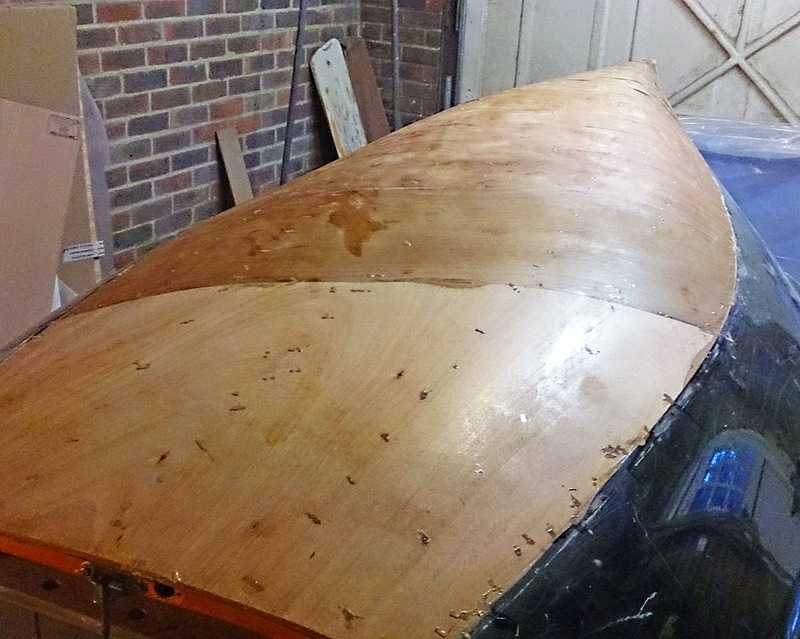 The familiar deep-Vee hull of the Mistral Classic Moth married to something different. With everything unfurled there is plenty of sail for this 11-footer. The crossbeams were stock lumber pieces screwed into the deck (the screws being replaced by through bolts when they started pulling out). Joe Frohock, master cobbler together of disparate pieces into a very credible sailing machine. 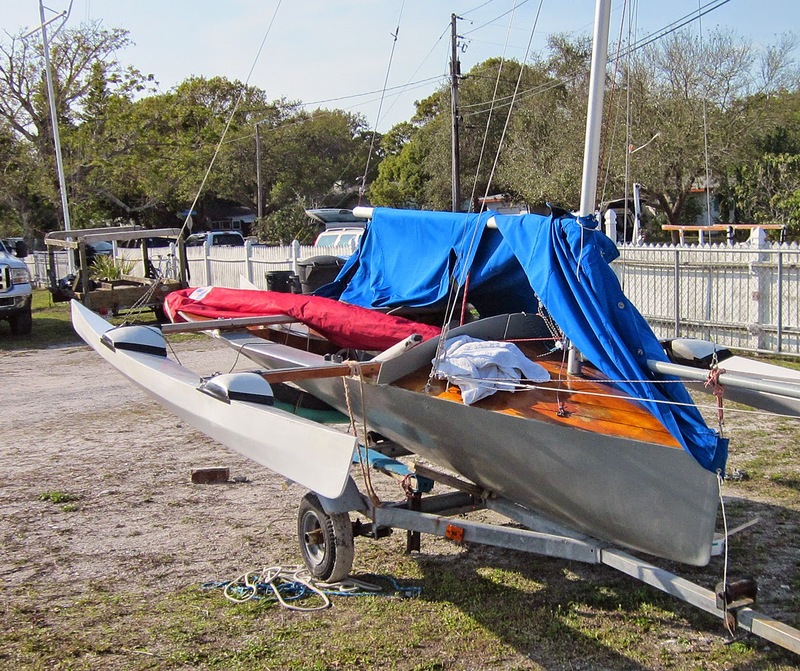 The 2015 version, entered in the 300 mile Everglades Challenge. Additions are some fairings for the crossbeam attachments and a massive foredeck coaming to keep water out of the cockpit. 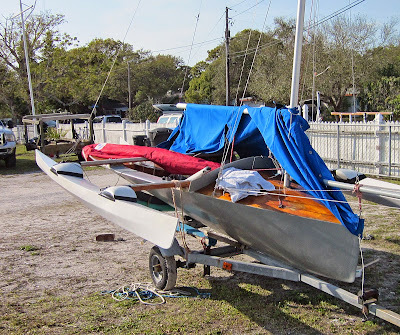 The word from Earwigoagin's reporter from Gulfport was once he loaded all the required Everglades gear he had water coming over the daggerboard trunk - time for a quick redesign! As with the sailing canoes entered there is no room for onboard sleeping! Good luck Joe! Read George A. 's blog post on the Mothmaran over here. The East Coast and this time, the Mid-Atlantic got dumped on by another snowstorm today. Oh, well, let's go with the flow. A CSNBC production on the Hudson stern-steerer ice-boats. This was filmed last year where the Midwest and East Coast had even more ice - if you can believe it. "Sailing on Ice" from CSNBC on Vimeo. And other ice-boat posts on Earwigoagin can be found by clicking here. 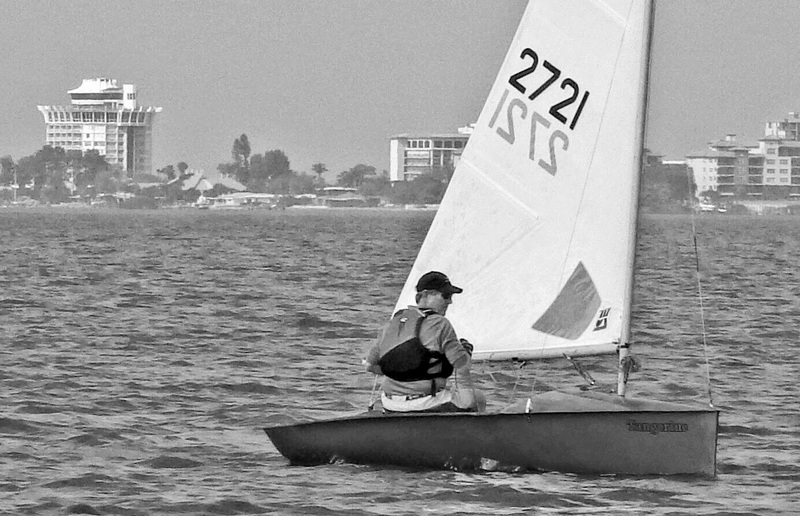 I have lots of sailing photos squirreled away on my computer. Sometimes I get confused as I did when I attached a photo of what I thought was a Fragniere Moth to a previous post. 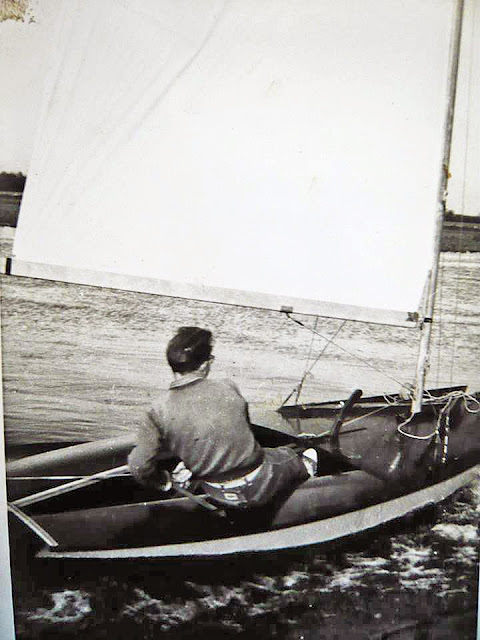 Mike Scott pointed out that it was not a French Fragniere, but himself, sailing a British Moth on the other side of the English channel - a photo he sent to me and then was misfiled. Rather than delete the photo completely, I'll just move it to this post and include two others. Here is a vintage photo of a Czechoslovakian (now Czech Republic) dinghy dock filled with Moths, a Finn, an O-Jolle and the Pirat Dinghy (Pirate in German). 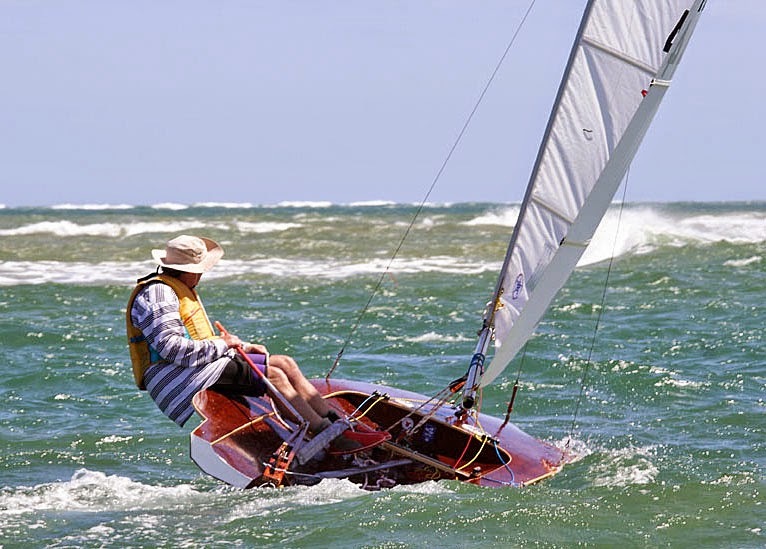 The two-man hiking Pirat was extremely popular in Europe in the 1960's and still sports big fleets today in Germany (as well as the singlehanded O-Jolle). It looks like the Race Officer is the one in the cap with all his starting gear on a portable desk, readying for a shore start. We're in an extended cold snap in the Mid-Atlantic with significant portions of the creeks and tributaries off the Chesapeake Bay frozen. 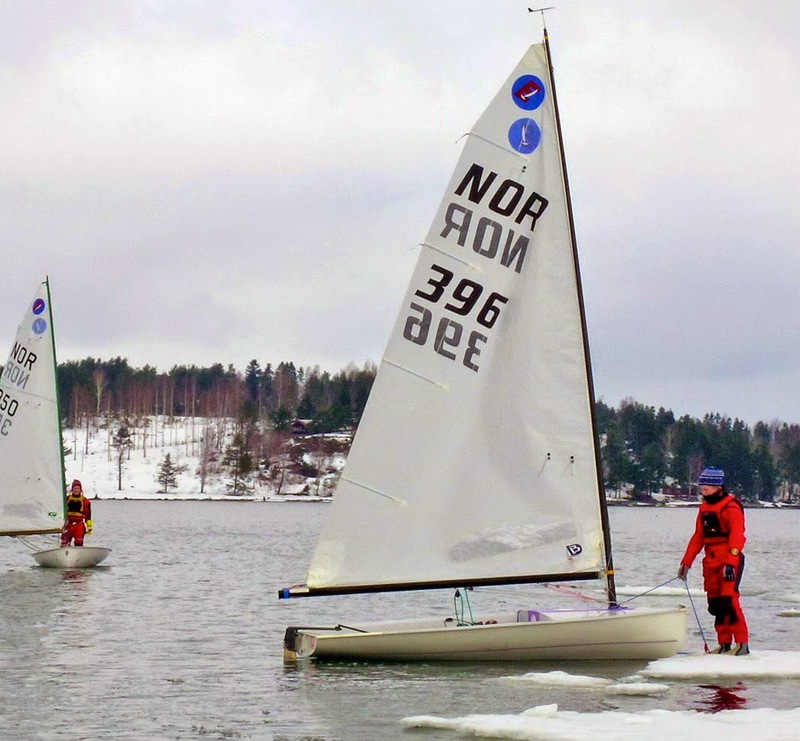 When all this thaws I wonder if we will have some ice floes big enough to support a person, as with this hardy Norwegian women sailor taking a break outside her Europe Dinghy! 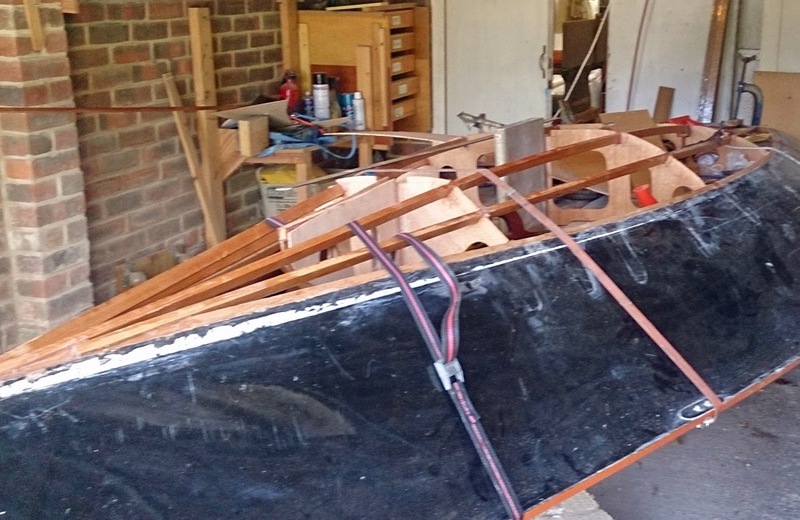 On modifying my Classic Moths I've rebuilt decks, rebuilt daggerboard trunks, added buoyancy tanks, glassed interiors, but I've never grafted a new bottom onto an existing Moth - performing a bottom-ectomy so to speak. 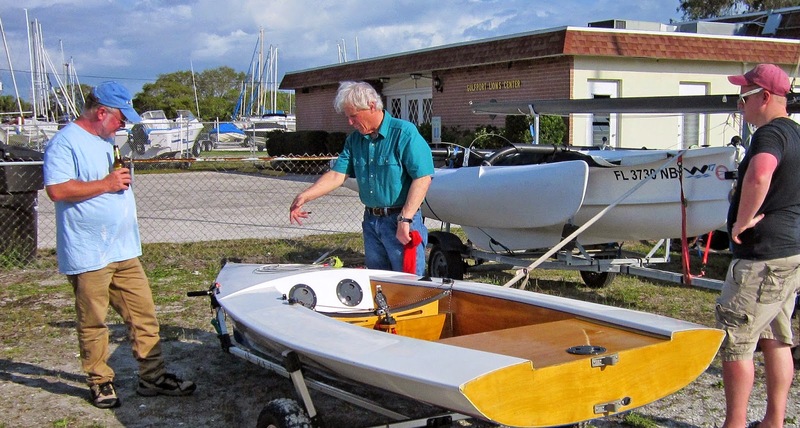 British Mad Mothist, Jim Champ, former Cherub sailor, dinghy historian, amateur dinghy designer, current International Canoe sailor, and webmaster of the International Canoe website is doing just that to a fiberglass Skol he purchased. I'll let Jim explain his project in his own words. "The back story is I picked up this 1970'ish Skol Int. Moth because I needed something to sail while a health problem was stopping me sailing my Int Canoe in most conditions, and besides, I'd always fancied one. The fact that I am now about 5 stone too heavy even for a vintage Moth didn't deter me. Anyway, the boat came out of someone's garage roof, and I completely failed to spot, under the layers of dust, that at some stage the boat had been sliced off at the waterline and been given a new wood bottom, replacing the original glass. This was no problem until after a season's use it became apparent that the wood bottom had been allowed to rot back in the day, and some crucial bits were now leaking badly as the water had re-penetrated. So I ended up cutting off the wood bottom, and I'm now building a new one, and learning about cold moulding while I am at it. Shape wise its roughly based on a Cherub I drew in about 1974 but could never afford to build. What have I learned from this project? Not to be afraid of cold moulding, and when you do it use plenty of strips. I originally was trying to use quite large panels in order to minimize the number of accurate edges I had to cut, but actually getting the sides of the strips accurate is surprisingly easy given a small sharp plane and a block and sandpaper. Its definitely right to have too many strips rather than too few. Getting the length right on a very 3d boat, on the other hand was a nightmare, but in any rational new build that wouldn't be an issue. 2mm ply was definitely much easier than 2.5mm veneer, having tried both, but if you use ply you can't varnish because the smart money is you'll go through the outer layer in some (or in my case, many) places when fairing up. I did the boat partly in 2 * 3mm and partly in 3 * 2mm. The junction between the two was something of a pain and in any case I carried 3mm too far forward. The last bit of 3mm was definitely excessively 3d. I'm sure the boat is somewhat asymmettric in that area because with the panels at 45/45 ish, bending the last bit was problematic. The first layer has a much bigger impact on final shape than subsequent ones, and in the transition on one side the first skin was 2mm and the other 3mm. 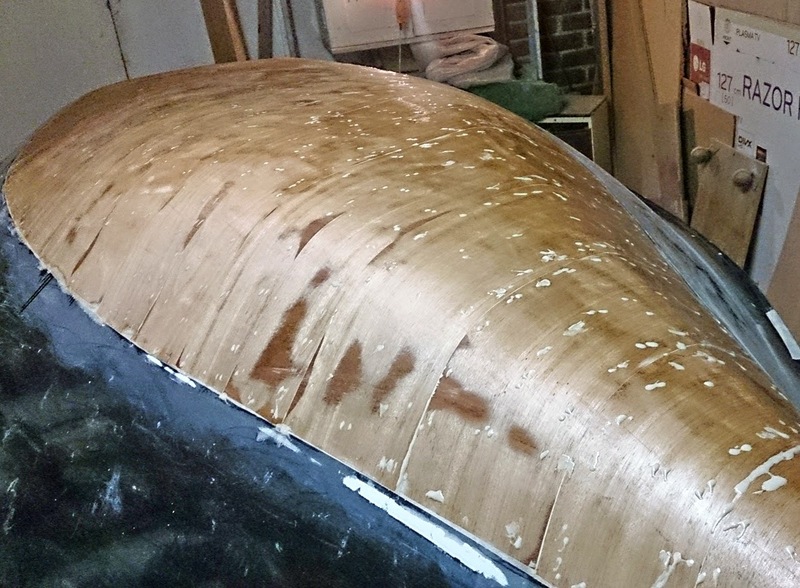 It would probably have been better to suffer the horrendous cost of the 2mm ply and done the whole boat in that. If I were doing a new boat it would be 2 * 2mm ply all over with a glass skin inside and out, uprating the inner skin appreciably in the slamming area round the bow by adding inner glass over skin and stringers, not under stringers. This was the first project I used a router on which was interesting. Vision really was a major problem, I guess my shop isn't that well lit because I found it really hard to see what the cutting edge was doing. For a long accurate cut to put a rabett in the glass topside (ouch, terrible thing to do to a cutting tool) I stapled a batten as a guide right along the boat and that was a major win. The other thing that helped with a router was to get a marker pen and colour the area I wanted to remove, which made it soo much easier to be confident about what I was doing. I still had a few slips in the wrong places though. Looks like Jim was able to cold mold over two stringers per side as well as the topside stringer junction. Finished hull. The Skol featured a self-draining hull. George A, fellow Classic Moth bloggist over at Mid-Atlantic Musings, has also deconstructed a Skol back to a bare hull. Click here to read about his Skol project. Jim adds the history of the Skol in the comments section which I've dragged to the main post. "From what I can make out there seem to have been 4 Skol [models]. 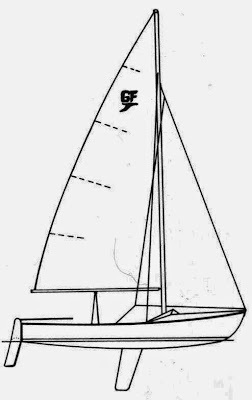 Mk 1 may have just been 3 prototypes, which look as if they had unstayed masts and a fair gunwale line. George A. 's boat is a Mk 2. The 1969 Moth yearbook said production was planned for two versions, a SL and regate version. The SL was to have a daggerboard and was the lighter built. The yearbook also says [it sported] an unstayed mast. I think in practice many were built with stayed rigs. They seem to have had false floors and stern tanks, at least some with drains through the stern tank. The actual production detail may have varied, but all had the little extra piece at max beam [hiking winglets]. Mine started life as a Skol Mk 3. She has a fair gunwale line, an open stern and a deck stepped mast. The shrouds were supported by glassed in alloy tubes down to the base of the mast foot.